I added 11/22/63 signing Savannah Georgia Book Festival, End of Watch Library of Congress, Joyland Hartford Conn and the George Mason event and Tsongas Center at Umass Lowell event. feel free to delete or edit any of these. all GREAT events. I just added a Bag of Bones signing that I was lucky enough to attend in November of 1998. Cool! Interesting that books HAD to be inscribed for that event. If I recall, King had become displeased with the secondary market at that time. Desperation. June 30, 1996. Unknown number of signed bookplates given out. According to a chap I spoke to there was about 200 given out that day. Unfortunately, we need additional backup, or an on the record statement from someone who was likely to know. Otherwise it's not a reliable enough number for the Catalog. Interesting that the spreadsheet has a drop down menu for States, but Oregon is missing. where is the actual spreadsheet. I don't see a link or anything anywhere! In reality I saw a guy on the elevator carrying a stack of 5 books, Dark Tower books. He got DT:I - DT:IV signed and if I recall, he even got a copy of Legands signed. It was my first King event. They had a woman with white makeup and white veils circling around moaning like a ghost. King talked and read LT’s of Pets. When I got to King he was wearing a Cubs jersey. We were talking about the Red Sox going to the Post Season (I’m from Boston). Then King showed me that right under the Cubs jersey he was wearing a Sox jersey. I added the event, but had trouble adding you decription of event. It overwrote stuff beneath it. Perhaps someone more savvy than me can add it without screwing up the sheet. I made a few minor changes to the King event at George Mason University on 9/23/2011. 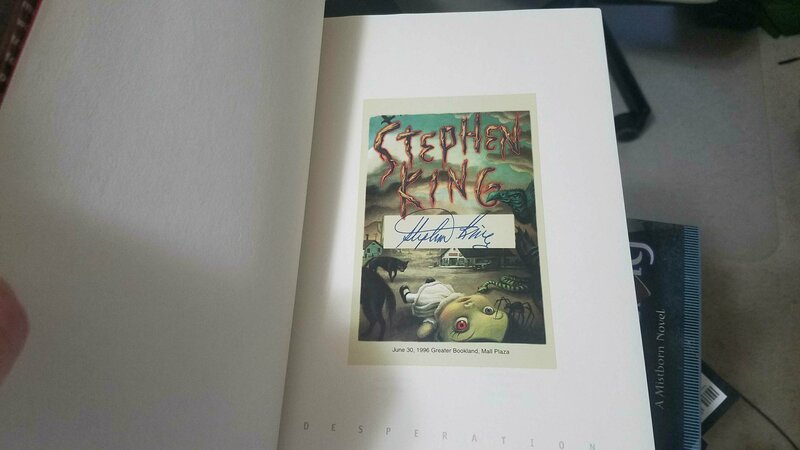 IIRC, each person got one King book of choice signed, but the Golden Ticket allowed 2 people in line, so in effect a person could get 2 signed books (using a mule). Unfortunately, I have no idea what city or state......but I imagine some crafty member out there will be able to figure it out. There is a Regency Court in Omaha, NE. Couldn’t tell how long it’s been there though. I think there is a very early pic (not dated) of King signing a stack of 'Salem's Lot copies in Beahm's Stephen King Companion. Not that it helps much in the way of the spreadsheet in post #1 but still neat IMO. I meant to word it as "the oldest known King signing listed on our master spreadsheet"
I have an April 16th 1974 signed Carrie. curious where that ranks in early signings. This was an event that I attended. King was invited to come and speak and later set up a table in the lobby to sell and sign paperbacks (and possibly HC, but I dont remember). I have seen other copies ( a BC copy of Carrie) in the wild with this same date but that may have been brought in and not actually sold there.